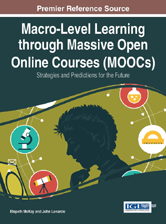 Macro-Level Learning through Massive Open Online Courses (MOOCs): Strategies and Predictions for the Future provides insight into the emerging phenomenon of MOOCs as a design manual for the course designer with a collection of chapters that deal with all facets of the MOOC debate. Chapter 3: Professional Learning through MOOCs? Chapter 8: What is Best for the Learner? WHAT IS THE FUTURE OF MOOCS?